Retired U.S. Supreme Court Associate Justice Anthony M. Kennedy visited the University of Virginia School of Law on November 15 and 16, christening the new Karsh Center for Law and Democracy and displaying a humorous side rarely seen from the bench. Retired Justice Kennedy onstage. Photo Kolleen Gladden ‘21. Kennedy, 82, was originally scheduled to visit the Law School in September, but the visit was postponed due to Hurricane Florence’s approach. This rescheduled visit took place on the Thursday and Friday preceding the Thanksgiving Recess, but attendance at Kennedy-related events was undiminished. Several venues in the Law School played host to the retired justice—Professor Micah Schwartzman ’05 described Kennedy as “generous with his time”—starting with a combined sitting of Professor J. Scott Ballenger ’96’s Civil Liberties and Professor Schwartzman’s own Religious Liberties courses on Thursday. 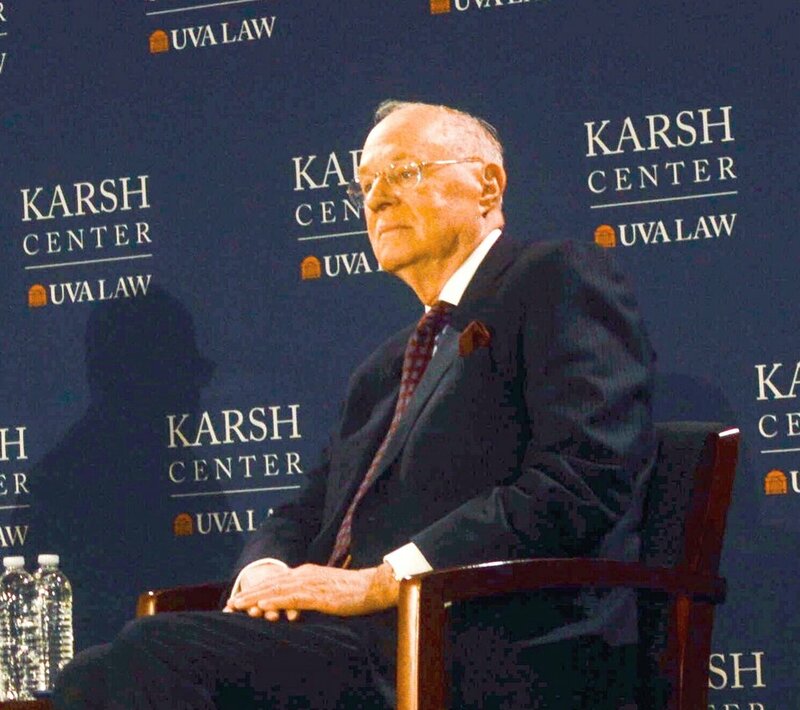 There, Justice Kennedy—the author of famed civil and religious liberties cases such as Church of the Lukumi Babalu Aye v. City of Hialeah, Lawrence v. Texas, and Obergefell v. Hodges—lectured on his jurisprudence and took questions from students. Next on Thursday, Kennedy participated in a lunch in the faculty lounge with a group of students selected from diverse backgrounds. The justice talked about his own experience in the law: law school at Harvard, returning home to take over his father’s law practice in Sacramento, and being appointed by President Gerald R. Ford to the Ninth Circuit. He quoted Aristotle, stuck up for the Socratic method, and recalled the very different days during which he began his law practice in Sacramento, days he said lived up to the term “old-boys club.” Asked his favorite film, Kennedy gave a classic Kennedy answer: Guess Who’s Coming to Dinner, the 1967 version starring Spencer Tracy, in which Tracy’s daughter is set to marry a black man, which makes her parents uneasy. As Kennedy describes the film, Tracy’s character stands out on his San Francisco balcony wrestling with his convictions, finally realizing that he’s wrong, that his opposition to the marriage was derived from his prejudice. Readers needn’t be experts in Justice Kennedy’s jurisprudence to know he was often held to have changed his own mind. From Planned Parenthood v. Casey, in which he joined the joint opinion upholding the core of Roe v. Wade despite previous opposition to legalized abortion, to Fisher v. Texas, in which he upheld the University of Texas’s affirmative action program after previously voting to strike it down, Justice Kennedy was renowned on the bench for his willingness to reconsider his own previous positions. Kennedy largely avoided providing answers to substantive legal questions, responding to Molly Cain ’20’s thoughtful question about how his opinion in Town of Greece v. Galloway—upholding explicitly Christian prayer by councilmembers in municipal meetings—might influence zoning variance decisions relating to religious minorities with a fascinating story about his own experience representing a client before a zoning commission. After the Karshes finished speaking, Dean Goluboff introduced David Rubenstein, who interviewed Kennedy for the event as part of his David Rubenstein Show on PBS. The conversation between Rubenstein and Kennedy centered on Kennedy’s years on the court and his reasons for leaving. To the latter question, Kennedy answered, “It’s hard leaving something you love, but you can do it for something you love more,” telling of how he had spent too many years working away from his wife Mary. Quizzed about his feelings toward his successor, Justice Brett M. Kavanaugh—who clerked for Kennedy and endured a brutal confirmation process that included accusations of past sexual misconduct—Kennedy ducked the direct question, but said, “The public will see that the system works” and reassured the audience that the Court “is operating in a collegial, thoughtful way.” When Rubenstein noted there were now two former Kennedy clerks on the Court (Kavanaugh and Justice Neil M. Gorsuch), Kennedy quipped, “All we need is one more and we can rule the world,” drawing laughter from the unsuspecting audience. That wasn’t his only laugh line; Kennedy caused laughter throughout the audience with his surprisingly on-point imitation of President Ronald Reagan, who knew Kennedy when he was governor of California and who nominated Kennedy to the Supreme Court.